I’d like to talk about collecting in general. One of the things that I always ask is this question to people … I have a friend of mine who collects exotic cars, a very wealthy man, he has quite a number of them and I put this question to him one day. I said, how much is paint worth? He said well, what do you mean, how much is paint worth? I said, is paint worth like, you know, some of these cars have 30 coats of paint, but how much is the paint worth? He says well, I don’t know and I said, well, I’ll give you an example. He had a Bentley and he had a few other cars. I said, suppose you could buy a Bentley. I’ll sell you a Bentley. Say it’s a $200,000 car and you could buy that car for $100,000, except there’s only one catch. We’re not going to paint your car. So whatever color the gray metal is and if you paint the car, you’ll get the car repossessed immediately. So you lose your whole $100,000. And I asked him, how many people do you think that would normally buy a Bentley would buy that car? And he said, I don’t think anybody would buy that car. I said, so you’re telling me the paint’s worth $100,000? He said, well, I guess so. So, the point that I’m trying to get to is when you talk about collectibles, pipes, and so on and so forth, and cars or whatever it is, you’re always talking about one thing, the finished product, because it doesn’t matter. People talk about the underlying cost, this or that and the other thing. It’s the perception of the finished product that really, in my opinion, is what makes something valuable. I mean, I had another guy. I like to use this. So okay, so the raw materials. They’re always talking about raw materials and so on and so forth and you say, well, okay, I’ll pick a Picasso and let’s break the paint down and the canvas. How much is that worth? So the raw materials in the case of a Picasso have no bearing at all in the value of it. You take a look at Parker and you take a look at Dunhill and you say, well, what makes a difference between the two? And of course, Dunhill, it is perceived and I perceive it, (I have many numbered Dunhills), as very much of a finished product. 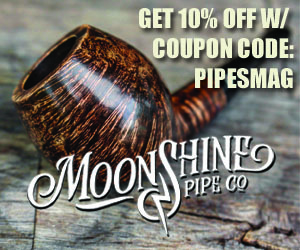 This is truly a must have for a serious "Pipe Collector". It is the "Shell" finish (a rough textured black sandblast) made by Dunhill in 1927. On the underside of the shank of the pipe it is marked: "Dunhill’s Shell Made in England", Pat.No., date, and numerous other numbers. To the left of the word Dunhill and Pat. No’s, etc., are the letters: "O D H" with the number "15" under these letters. On the top side of the mouthpiece close to the shank it is stamped "Reg No. 654638. On the reverse side is the Dunhill trademark, "the whitespot" in ivory, created by Dunhill in 1912. (Today, the "spot" is now fashioned of high-grade acrylic). It measures 11 inches long by 3-3/4 inches wide at the bowl. This is definitely a "larger" than normal pipe and quite heavy. Inside the leather case the lining is velvet and silk. It has a 3-plume crown logo and under it reads, "By Appointment" Alfred Dunhill, Ltd. - London. The Parker as less of a finished product. You say, well, what does that mean exactly? I have seen in my lifetime maybe 50 Dunhill Magnums, I don’t know, there might be more out there. There’s just a few and I’ve seen about 6 or 7 Parker Magnums. So, 50 Dunhill’s and 6 or 7 Parker Magnums, and I’ve looked very closely at Mike’s pipes and I have two and there was one, there was a beautiful piece. It was on EBay, a Parker Magnum and it sold for like almost as much as a Dunhill. It sold for $2,600 bucks, which they found to be incredible. And I was thinking, I’m saying to myself, what’s the difference between some of these early pipes? Now, Howard has kindly provided us with so many different resources. He was working in his plumber position. He was a tremendous resource to John and myself and gave us so many different things to look at and you really got an understanding. It’s a deep understanding about some of the Dunhill pipes and what they were doing. But, you know, the Parker actually produced in their catalog that one, as Michael said, that they had a range of giants, but I don’t think the giants were the small pipes. I think the giants were the large pipes. I think the giants were the magnums and I think the first catalog that you showed us was 1925 and then it was repeated in 1937. So, unlike Dunhill Magnums, Parker Magnums are actually part of a catalog where I’ve never seen a Dunhill Magnum in any catalog. So, that’s interesting. So, if it’s a catalog pipe, you say to yourself, and they were actually sold … The Parker’s were actually sold to stores for this display and their customers liked them so much that they bought Parker Magnums to take home with them. So you would think that there would be a lot more Parker Magnums around than there’d be Dunhill Magnums because it was a standing production pipe, it’s in a catalog, customers liked it a lot. But, I think part of the main reason why there aren’t as many Parker Magnums is because in England, as we know, what do you do with old pipes? You throw them away. Okay? So even if it’s a large Parker, you throw it away. And that’s why I think, we have fewer and fewer Parker Magnums than we have Dunhill Magnums. My little bit of study of the Dunhill Magnum over the last 27 years, I’ve been able to find out in many cases, what actually the history of the pipe was. So, I found that in most cases, the Dunhill’s were purchased for gifts. Now, they might have been in the stores or display, but you have to think, you’re a retailer, you’re not going to want to put a Dunhill Magnum on display if you have the opportunity to buy the same size pipe as a Parker because you’re going to be able to spend a lot less. It’s for a display, it’s going to go into the window and not generate revenue. So, my opinion is that people didn’t view the Parker’s as very valuable. The Dunhill’s were purchased as gifts, not for smoking, I know one was bought for smoking, but many of them were bought for gifts. They came, you’d buy a fitted case for them so they assumed the level of importance that a Parker didn’t assume. So that’s why I think we have more, but you say to yourself, okay, now, let’s look exactly at the pipe themselves. Now, of Mike’s 4 Parker Magnums that he has, they’re beautiful pieces, and my 2 Parker Magnums … it’s a lovely shape, it’s from 1927, and the other one’s a billiard, which is an LV shape from ‘26, and they’re beautiful. They’re beautiful and John has one too. And that is a lovely looking pipe. Mike also had a few LC’s, which are large pipes and I’ve owned a couple of Dunhill LC’s and I’ve owned one Parker LC. I really examined them and I’ve said to myself, what makes up the difference? Why is one a Parker and why is one a Dunhill? And I basically think there’s several reasons for it, but the real reason I believe is the depth, there’s two reasons, one is a depth in the blast, and the other one is if there is a flaw. Now, if you look at the Dunhill’s I have from 1924 … Dunhill was cutting the bowls in 1920, but I believe the first real Dunhill Magnums, they were produced by the factory, were produced in 1924 because from 1921-1923, which is the first year that I’ve ever seen of the Dunhill Magnum, 1921, they were what I call … They were very, from the side, there were full bents, very elegant looking shape around the billiard. From the top though, they had maybe, let’s say they were an inch, maybe, say, 2 inches across in diameter, maybe a little less, but the walls were maybe a ¼ of an inch, which means that the bowl was gigantic. So, the chamber was really gigantic in the top, which is a very old style and they were cut in, instead of a U shape, they were cut in as a V shape. Now, what’s interesting is I also have, and I mentioned this before, is some BBD Magnums of the day. And interestingly enough, you can interchange the stems of a BBD and the stems of a Dunhill Magnum. I believe at the time that BBD was not buying bowls from Dunhill. So, if anything, Dunhill was buying bowls, precut, predrilled, and they were just finishing them and fitting the stems on them because there’s also one other flaw in the 1921-23 Magnums, is the pipe cleaner doesn’t go through because Dunhill, in the early days in their production, what I call a double air hole. So you had an air hole and there was another small one below that. The small one made it go down into the bowl so deep that if you put a pipe cleaner through, that you couldn’t get it through into the shaft. On all the Parker Magnums I’ve also noticed that the quality of the wood is tremendous, that it’s very densely grained, they have tremendous bird’s eye configurations, but it’s not deep. But in all the Dunhill Magnums, 99% of them have a very deep blast. But that doesn’t necessarily mean that the graining underneath is that good. It just means the wood was such that it was able to take the blast and take it to another level, to a deep level. Now also, you say to yourself, okay, that’s a possibility and so esthetics then, played a significant impact. So if a bowl was deemed to be a Parker quality than maybe it’s because the blast wasn’t quite as deep. Also, on some of the Parker’s there is no flaw on the blast. It’s on the side of the bowl. I have Dunhill’s, where the blast, there is a flaw on the bowl, but it’s on the front or it’s below on the bottom. And so you’d say because if you look inside, I have one Dunhill, it’s got a big piece of branch with a knot, right in the front of the bowl and you would say well, that really ought not to be a Dunhill, but the blasting was phenomenal. The blasting was deep. It’s tremendous. So I mean, there was nothing written on this. I’m just talking like an archeologist digging through the sand. But that to me is a big thing. Where the blast placement was and the depth of the blast. Now, in a Dunhill of course, they say, they have handmade stems. Dunhill did have handmade stems but I noticed on all the Parker Magnums, the stems were also handmade, but they’re not as finely crafted. Okay? On a Dunhill, every Dunhill had a taper. I mean, except for one. They’re all tapered stems, but if you look at the end of a Dunhill Magnum, the taper’s in. So they taper in, they’re narrow, and they’re very elegant. The lip is very elegantly made. The sides of the lip, if you look from the top, are slanted in. Someone took a lot of time and someone took a lot of effort to make that stem. In the case of Parker, you have the handmade stem, but there was no craftsmanship in the end of the stem. I mean, they’re nicely made and they’re comfortable, but they’re not elegant. So to me that’s a difference between the Parker Magnum and the Dunhill. And I’ve seen that on LC’s too. If you look at the quality of Michael’s blast on the LC’s, the blast, the difference between an LC over Parker, and an LC of a Dunhill is, there’s not that much difference. Of course, there’s a lot of difference in the market. It’s back to my point of, my original point of discussion. When you think immediately of a Parker, you say it’s a second class piece and if you think of a Dunhill, it’s a first class piece and of course, that’s how we think as human beings. Now, John and I used to have some discussions about well, it maybe was a Dunhill once, but did it become a Parker? Did it go through the oil curing process? And later a flaw was discovered and now we have a Parker, but it’s oil cured, so I don’t know what the answer to that may be, but those are trade secrets. But what I’m trying to say is that perhaps, there are differences, but the differences are not as significant as one might think. There’s a great difference in market perception. Now there’s a tremendous difference though in what I call the new group that’s really surfaced since 2001. I call them the Super Magnums. I have 3. I’ve only known 3 and I own 3 of the OD’s. Those are the ones that have an OD stamp on it so there are 3, and these are much, much larger than the average Dunhill Magnum, so I call these, they are like a Double Magnum or a Super Magnum, and they’re much larger, and they’re a whole different animal. Now I used to think that the 120 shape, that wonderful 120, which is simply the domain of the Dunhill Magnum, but recently on the British EBay, this is the one that went for $2,600, there was a 120 shape from 1926, there was a Parker and it had a really exceptional blast on it in my opinion. Why it became a Parker, I don’t know. But I do believe, on that particular pipe, that the pipe was not actually made in 26, it was made in 1924, due to certain characteristics of where the blast ends and where the smooth part ends and where the blast begins by the shank and a few other things. So it’s an interesting piece. So, the difference between the Dunhill and the Parker, I think in some of the early days, may not be as great as we might think. Of course as Mike said later on, there’s a tremendous amount of difference, mainly in the quality of the wood, there’s a lot. But in the early days, and you could go through some of his early smooth pieces too. You’d say why is this a Parker, why is this a Dunhill? But even so, I still won’t pay the same price for a Parker as I will for a Dunhill. One of the things I also then want to just briefly touch on is, because there’s been some related interest in some of the bigger, the new and bigger Dunhill’s, and then some of the pipes from the 70’s, in what I call the 612 shape, the 622 shape, and so on. And I just want to mention that my own impression is that if World War II hadn’t happened, we probably still would have had magnificent Dunhill Magnums being made until the current date. I mean, using the same styles and everything, but World War II just really changed everything. It changed attitudes, it changed people’s opinions about what they wanted in their pipes, the looks of the pipes, and so on and so forth. So what happened is, after World War II, you don’t find any Magnums. The largest pieces you’ll find are the ODA pieces and those pieces are more, like everybody knows, they’re standard shapes, they’re large, maybe go up to 2 ¼ inches as opposed to 3 ¼ at the top end or more. And so what happens is you find that there’s just, what I’ll call a smaller pipe. It’s a large piece compared to group 4, but it’s a smaller pipe overall. Then in the early 70’s, Dunhill made a decision. I talked to, there was a fellow, I think his name was Michael Walters, and he worked at the Dunhill store. He was a manager and he was a very knowledgeable man. I talked to him about some of the things that were happening at the time in the 70’s when I first started collecting. What happened in the mid 70’s of course, was Dunhill discontinued the ODA and they came out with a group 6. The group 6, of course, was the same size as the ODA for the most part, and some were larger. Those larger pieces were the 612’s and the 622’s. Now, there were two styles. One style was like the classic 840 full bent and the other style was more of what John calls the Modern Magnum, the Modern LC, which was a larger bowl, the shape was more of an LC. I won’t call it a classical LC, but it was more of an LC. And they made, from 1975-1978, when the ODA was returned, but the ODA in 78 was the same as the 612 LC shapes. They made a tremendous variety. They made, what I’ll call a small one, which is maybe, I don’t know, 2 ½ - 2 ¼, then some that were 2 3/8. They made some that were 2 5/8, and they made some real giant ones that were almost 3 inches. So, I find it interesting and I don’t know what the reason was, the return to this particular giant shape, why they chose this particular shape. But what happens after 1978 is the giant shape again, once again, now you have the collectors free hands, and so on and so forth, but standards sort of fade. So, from the Magnum period up until the mid 70’s, there’s really nothing of any consequence. From the mid 70’s to maybe the late 70’s, you have this giant shaped pipe and then nothing else happens. Then in the 90’s, I remember talking to one of the Dunhill reps, he said, oh yeah, we’re only going to produce group 4 and 5 shapes and sizes. I said, really? Then all of a sudden, in the late 1990’s, the return, really, of any significant quantity of the ODA in limited shapes, limited finishes, and so then you have the freehand and the hand turned pipes. Now all of a sudden, the giants came back in. Now, I won’t speak too much longer on that, but there’s two classes, what I call two classes of giant pipes made after 2000. That’s the Collector, the so called freehand, free form pipes, but wouldn’t it be nice if they once again returned to making a magnum sized pipe of a standard shape? And I remember we had this discussion and I figured well, you know, it’s a nice discussion. They’re still not going to do anything about it. And what happened is, of course, they began to produce a Bent shape. I believe that they were all introduced in 2003, at least every Bent I’ve seen, except maybe for one or two, were produced in 2003. So what you did was, you had the return of the classic Bent Magnum but I might add it not the shape of the 1920’s which was more like a cross between an LC (large curve) and a shape "120" bent. Fabulous transcript. A lot of useful info for the Dunhill collector. I wonder what percentage of these Dunhill Magnums were smoked? Since they were store display items and some were sold as gifts, I’m wondering if their owners actually smoked them, given their size.